Like most families we have a main room, where the TV is, and a nice comfie couch. This is the place to plop down, watch a show or snuggle under a warm blanket on a cold night etc. And it is not short on Junk. The TV sits on a vintage Mid Century Side-Board with one of my favorite finds, genuine foundry gear molds behind on the wall. The side-board, works great as a media storage space and was painted this wonderful blue/green teal color when I got it. I think the globe ties the side-board color and the wall color together nicely. Opposite the TV is the couch and sitting area. This is a large wall space to cover, and I've had several different thing above the couch over the years. Currently I have two framed vintage maps here, and it works nicely in my attempt to declutter and clean up my spaces. The other half of this long rectangle room is for my husbands vintage organ and harpsichord. 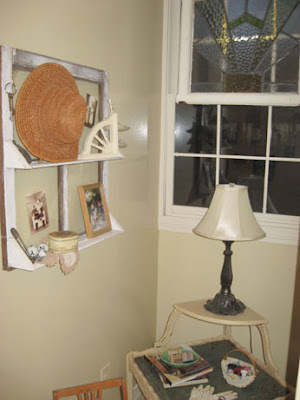 One of the reasons I like Junk as decoration is that it can be very inexpensive. I like to change things up often, and junk allows me to do this without breaking the bank. Think about framed art. You know how much it costs to get a print, matted and framed, it's outrageous. Well junk frames up much cheaper. I hope you enjoyed my family room. It is one of my favorite rooms in the house. As you can see, Junk can be used in with traditional and retro decor as well. It's not just for shabby chic or cottage. It is my Junked up guest room. When my oldest son moved out, I wasted no time turning his room into my dream junk guest room. The room has 2 windows and I covered each one with a topper using an old burlap coffee bag, cut in half, and hung by old hinges, That big thing between the windows is 1/4 of a windmill I purchased in April The cabinet below is really cool when you open the doors, it is full of little cubbies. I added the feet. I found the rocker at a Garage Sale for $5. The metal candlelier was an item I traded another dealer for. It's a fun piece. And an old shopping cart as a hamper. Wooden gears and a valve handle accessorize the top of the cabinet. As with all things junky and decorating related, my tastes changed quickly. In 2013 I updated this room, with some retro color. Clear jars store my tidbits and treasures for creating jewelry etc. This retro sewing table was another Garage sale find as was the fabulous Texas map. This is the room where I do all my blogging, Etsy listing, and web design. It was intended to be a dining room, but It is much more useful as an office. There are lots of flea market finds in here. As I look around the room it's easier to tell you what was not purchased second hand. The big arm chair and the book shelves and books. Everything else was found while I was out hunting junk. From the lamps to the side tables, From the radio (retro fitted for an iphone) to the desk accessories. All are Flea Market Finds. 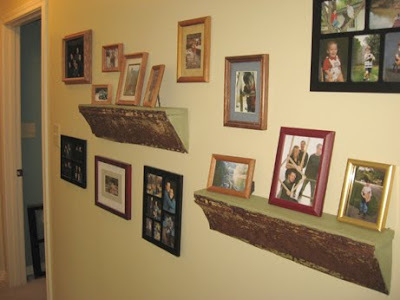 This is my brag wall where I have many family pictures. I've made 2 shelves out of old ceiling crown molding to add dimension to the display. A collage of Vintage frames make a creative towel bar, in this bathroom remodel. The table is a $4 garage sale find. I painted it and then inserted a piece of old ceiling tin into it. On the window I've hung an old stained glass window. These are some books that I've got on my wish list. They all look great so check em out. Have you ever made an Amazon.com Wish list? It's fun, and when someone asks you what you want for your Birthday or Christmas, you can just email them your Wish List.